Tamaño de esta previsualización: 800 × 503 píxeles. Otras resoluciones: 320 × 201 píxeles · 640 × 402 píxeles · 1024 × 643 píxeles · 1280 × 804 píxeles · 3696 × 2322 píxeles. Cleveland Park Historic District in Washington, D.C. is known for its concentration of Colonial Georgian frame houses, many of which were designed by prominent architects. Among them, Twin Oaks is the only remaining example of a house originally designed to be a summer home. At more than 7.3 hectares--nearly the size of the White House compound--Twin Oaks is considered the largest privately owned estate in the District of Columbia. The house has been listed by the Washington, D.C. government as a historic building and placed on the National Register for Historic Sites. Twin Oaks, which is owned by the Republic of China (ROC), has also served as a residence for influential individuals in US history. Original owner Gardiner Greene Hubbard, for example, was the founder of the National Geographic Society, and his son-in-law Alexander Graham Bell was the inventor of the telephone. Visitors to the estate, which is open to the public on special occasions, can still see an early prototype of the telephone that was possibly used by Bell himself. Yet to the ROC government, Twin Oaks is not only a historic site, but also a symbol of decades of Taiwan-United States relations and friendship. Earlier this year, the Taipei Economic and Cultural Representative Office in Washington commissioned photographer Gary Landsman to create a photo exhibition as part of the activities marking the 120th anniversary of Twin Oaks. "My first visit was only to survey the property and determine which rooms and elements were to be photographed," Landsman says. "However, I soon realized that my task was to capture two architectures at once: the physical attributes of this exquisite building and the carefully arranged artifacts of the decades-long relationship between Taiwan and the United States." The land that Twin Oaks sits on originally belonged to Uriah Forrest, an American Revolutionary War general. In 1888, his descendent sold the tract to Hubbard, who then commissioned Richard Allen, one of America's leading architects at the time, to build a family summer retreat. The Paris-trained architect designed a 26-room house in the early Colonial Georgian style. The Hubbards began renting the home to a succession of prominent personages in the 1930s. In 1937, it was rented to the new ambassador from the ROC, Thomas C. T. Wang. According to a press report at the time, Wang had taken one look at the cramped ROC embassy and decided to rent a home in Cleveland Park to provide some elbowroom for his wife and two young daughters. He found the perfect place in Twin Oaks--a "big, old, yellow frame house on the hill." Over the next decade, the Hubbards continued to rent Twin Oaks to Wang and his successors. In 1947, the Hubbards sold Twin Oaks to the ROC, which was represented by Ambassador Wellington Koo at the time. Twin Oaks' front parlor, replete with rosewood furniture and Chinese rugs, is also referred to as "the blue room." The painting of a plum tree on the wall is by renowned Taiwanese painter Au Ho-nien. (Photo by Gary Landsman) The estate remained in the possession of the ROC after the government left mainland China and moved to Taiwan in 1949. 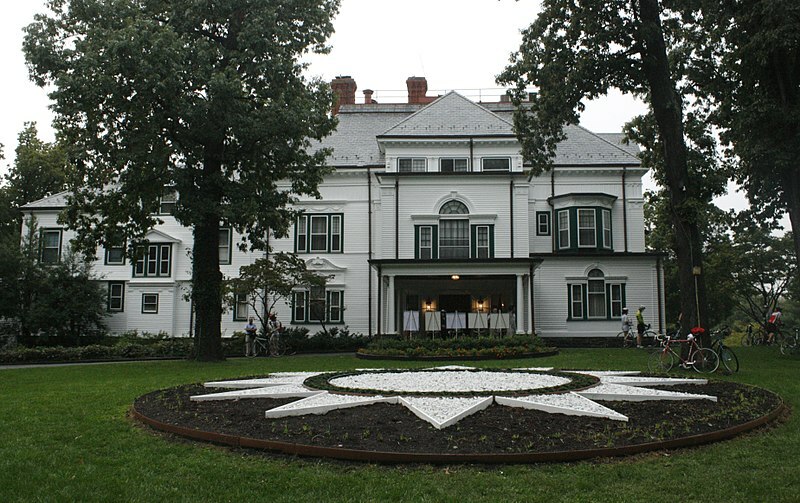 Between 1937 and 1978, nine ROC ambassadors lived at Twin Oaks, where they entertained members of the US government and diplomats stationed in Washington. Then, quite unexpectedly, the ROC temporarily "lost" ownership of Twin Oaks due to changes in US diplomatic policies. The changes began when former US President Jimmy Carter announced on December 15, 1978 that the United States would switch diplomatic recognition from the ROC to mainland China on January 1, 1979. Fearing that mainland China would claim ownership of all its assets in the United States, the ROC government asked Thomas G. Corcoran Sr., who was known as a staunch supporter of Taiwan and a "whiz kid" in former US President Franklin D. Roosevelt's administration, to help arrange for the sale of the Twin Oaks estate to a private US group, the Friends of Free China Association. The deal was closed less than a week after Carter's announcement. The passage of the Taiwan Relations Act in April 1979 helped Taiwan's efforts to retain Twin Oaks. Under the terms of the act, the US recognition of mainland China was not to "affect in any way the ownership of or other rights or interests in properties, tangible and intangible, and other things of value, owned or held on or prior to December 31, 1978, or thereafter acquired or earned by the government authorities on Taiwan." The Carter administration, however, continued trying to help mainland China claim ownership of the property. It was not until September 1982 that ownership of Twin Oaks was legally transferred to the ROC government. Since then, according to Fredrick F. Chien, a former ROC representative to the United States, there has been a "common understanding" between Taipei and Washington that Twin Oaks cannot be used for "official" or "governmental" events or other activities "incompatible" with the status of the countries' relations. Based on this principle, Twin Oaks cannot be used as the residence or office of the ROC representative to the United States or for the ROC's Double Tenth National Day festivities. However, it can be used for cultural, economic and social purposes. Chien served as Taipei's representative to Washington from 1983 to 1988. When he first took up the post, the mansion was in need of extensive repairs. With the approval of the Ministry of Foreign Affairs in Taipei, Chien and his wife supervised the repair of the mansion's structural problems, the repainting of its exterior and the restoration of the interior's oak woodwork. For the two parlors and dining room on the first floor, they ordered rosewood furniture and Chinese rugs. They also commissioned Chinese paintings for all the rooms, including works by famous painters Chiang Chao-shen, Au Ho-nien, Chang Dai-chien and Huang Jun-bi. In one of the sitting rooms hangs the most prized artwork in the Twin Oaks collection, a painting that the Guangxu emperor of the Qing dynasty gave to his mother, the Empress Dowager, on her birthday. The painting depicts peaches and other Chinese symbols of longevity and good fortune. Nearby is a glass-faced curio cabinet filled with many rare and valuable Chinese objects collected by imperial Qing envoys as well as ROC ambassadors and representatives to the United States. While the ground floor is decorated in the Chinese style, the upstairs is Western, complete with sofas and fireplaces. "We told our guests that we've tried to maintain a balance of trade even in the interior decoration," Chien lightheartedly recalls in his memoirs. Thanks to the efforts by Chien and other ROC representatives, Twin Oaks has been restored so that visitors can once again appreciate its peony gardens, Colonial Georgian architecture, Chinese paintings and Qing antiques. When Twin Oaks' 120th anniversary was celebrated in April, many of the former ambassadors and important contributors to Taiwan-United States relations were invited to the mansion for a dinner party to honor the lasting friendships that have bound the two countries together for decades. "Twin Oaks has faithfully assisted Republic of China ambassadors and Taiwan representatives alike in continuing to foster relations with the United States, through good times and bad, for over 70 years," says Joseph Wu, ROC's former representative to the United States. "It stands today as a symbol of our warm and abiding friendship and deep-seated belief in freedom and democracy." Esta imagen, originalmente subida a Flickr, fue revisada el February 12, 2011 por el administrador o revisor File Upload Bot (Magnus Manske), quien comprobó que el archivo se encontraba disponible en Flickr bajo la licencia nombrada en dicha fecha. National Register of Historic Places listings in western Washington, D.C.